Other related stories are also told with the melody Wang Ji. The version of Oulu Wang Ji played today also uses standard tuning, but is otherwise musically unrelated to the earlier one described separately. As can be seen from the related chart (based largely on Zha Guide 4/42/64) versions of this melody survive in over 40 handbooks from 1620 to 1961 (though some of the later melodies listed in the Guide also seem unrelated, such as the one in Youshengshe Qinpu). Sources for the theme are also given under Wang Ji. 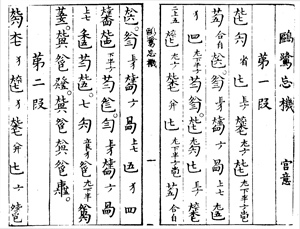 The earliest known ancestor of this modern Oulu Wang Ji (sometimes written Ou Lu Wang Ji) is the present melody, in three sections, published in Sizhaitang Qinpu (1620), a handbook compiled by the wife of a late Ming dynasty prince. The prince was apparently a cousin of Zhu Changfang, who compiled Guyin Zhengzong (1634). The 1634 version, though divided into four sections, is very similar to 1620 and is also called Oulu Wang Ji. Also quite closely related is the third version, in the late Ming Taoshi Qinpu, though it also adds lyrics. These three, though otherwise related to the modern version, are all missing the opening harmonic section, which is first introduced in the fourth handbook, Huiyan Mizhi (1647). After this the overall melody gradually became more elaborate, particularly in the latter part. There was also considerable variation within the tablatures, right up to the present. Note in particular the alternate first section beginning in 1677. None of the original four handbooks with this newer version has any attributions or indeed any commentary on the melody. 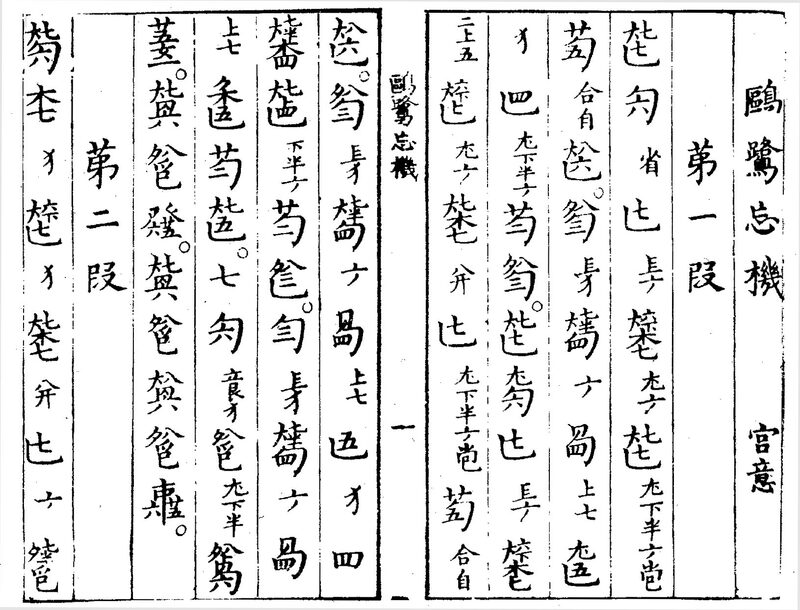 In fact, the only attributions in later handbooks connect this new melody to Liu Zhifang and the same story from Liezi told with the Shen Qi Mi Pu version (and with some of its six related versions through 1585), suggesting they either didn't know or didn't care about the actual source. As a result we have no real information on the source of the latter melody. Only one other handbook seems to do this: Zhang Jutian Qinpu (1844) repeats these three. 海日朝暉，滄江夕照。 A day by the sea in morning sunlight; by a broad river the stars shine down. 群飛眾和，翱翔自得。 A flock flies, gathered as a group; soaring at will. When going into the melody it uses jinfu (slide up then back), tuifu (slide down then back) again seeing diechu (repeat out, causing people who) listen to these sounds to have their hearts happily go pit-a-pat. (As for the circumstance that) this sort of finger techniques are nowadays rather esteemed, (Daoist scholars very much disapproved, to the extent that they attacked it as) exceeding even that which goes beyond (the improper music of) Zheng and Wei. (From the Afterword in Qinpu Xiesheng ; the Zha Guide indexes this handbook so I do not know why the quotes here are not in the Guide/43ff). There are many recordings available interpreting modern versions of Oulu Wangji, including a particularly interesting one from the 1950s with guqin and erhu fiddle.5 The versions most commonly played today seem generally to be based on either one or the other of the two available through transcriptions in Guqin Quji (GQQJ, I/250-2 and I/253-5).6 In that book both are said to come from the version published in Ziyuantang Qinpu (1802). In fact, although the first, based on an interpretation by Zha Fuxi (recording), does follow the 1802 tablature quite closely (as does this recording by Pu Xuezhai), the latter, transcribing a recording by Guan Pinghu, instead follows very closely the version in Wuzhizhai Qinpu (1722; the recording by Xu Yuanbai also follows this). Somehow, comments with the most commonly available Guan Pinghu recording make the same attribution error (the GQQJ transcription also does not indicate the 3 sections: in fact, section 2 begins with p. 254 line 4; section 3 with m.2 of p.255 line 6); in addition, at 4.39 of the recording (total length 5.14 instead of 7' given in GQQJ, though until the end the notes are basically the same) Guan completely changes the ending (1722 ends with the nine notes written here in harmonics, as with almost all other versions the last note being harmonics in the 7th position of the 1st and 3rd strings [sol and do]; in the recording Guan adds several phrases leading up to a last note that is harmonics in the 7th position of the 2nd and 7th strings [both la]). With regard to Guan Pinghu changing the last note from do over sol to la over la, this reflects a certain ambivalence within the melody about the most important tonal center. As stated here), in the 1620 version, though stated as gong (do, 1) mode, the first two sections clearly have yu (la, 6) as their tonal center, though section 2 suddenly ends on a strong do cadence. The melody then resumes with la as the tonal center until the last few phrases, which again have do as the tonal center. Some later versions also seem to follow this structure. In 1620 instead of writing out the closing harmonics there are simply the instructions to play the harmonics of the gong modal prelude, which ends on do over sol. With the closing harmonics beginning on la, its final note could also have easily been on la, as in the Guan Pinghu modern version. A careful study shows that both the 1722 and 1802 versions are clearly related to the 1620 original: comparing tablatures one can see connections throughout (e.g., the beginning of 1620 sections 2 and 3 are echoed in the same in 1722, as indicated above; for 1802 this is at GQQJ p.251 line 3 and measure 3 of p.251 line 8). However, the differences are such that it is unlikely that someone simply listening to an accurate reconstruction of the 1620 version would easily hear its connection to the modern version. Most noteworthy, in addition to missing the opening glissandos, the 1620 version seems noticeably more condensed. According to my own understanding of the 1620 version, the increased elaboration of the later versions changed the rhythms quite a lot. In addition, as can clearly be heard in this recording from 1620, during the first two sections (after the opening harmonics) the music alternates from phrases played in the upper register to responding (or perhaps corresponding) phrases in a lower register. Also, in the opening harmonics from 1647 and at the beginning of the third section (1647 Section 4) the phrases constantly rise and fall between the upper and lower registers. It is tempting to see this as a conscious contrasting of birds in the sky and humans on earth. As the melody later became elaborated this aspect of the melody seems to have become lost, or at least hidden. Musically unrelated to the 1425 Wang Ji. Although the 1647 version divides Oulu Wang Ji into more sections, other than the addition of the opening harmonics section it is not much longer than the 1620 version. 03.37 "Play the gong modal prelude, then end"
04.00 (End) Return to the top or to the Guqin ToC. As further discussed below, based on standard tuning considered as 5 6 1 2 3 5 6, for most of the melody the main tonal center is the equivalent of the open second string (la), but then at the end of the piece the tonal center changes to the equivalent of the open third string (do); in both cases the secondary tonal center is mi. For further information on la and gong modes see Shenpin Gong Yi and Shenpin Yu Yi as well as Modality in Early Ming Qin Tablature. 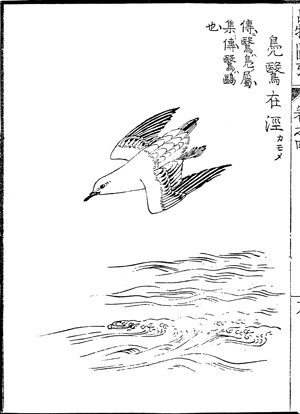 The story in Liezi is vague both about location ("海上 on the sea") and type of bird ("漚鳥 ouniao"), so perhaps instead of showing a bird it would have been just as good to include as an image the original tablature, as at right (note the missing opening harmonic section), as was done with the 1425 Wang Ji. 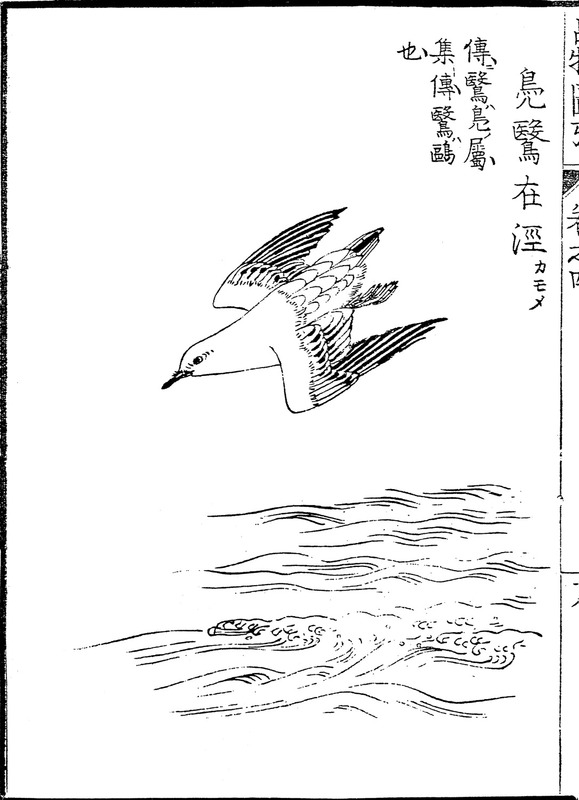 As for the bird above and its location, the image is an illustration from Maoshi Pinwu Tu Gai connected to the Shi Jing poem "鳧鷖 Fu Yi" (47624.54, 鳧鷖 references Shi Jing #248, Da Ya: "鳧鷖在涇 wild duck on the Jing river"). Some dictionaries translate "鷖 yi" as "seagull", but the 涇河 Jing River (Wiki) is a tributary of the 渭河 Wei River in Shaanxi province. If one can associate such a bird with such an inland place, perhaps Liezi's location was also originally envisioned as by a lake or a wide river rather than by the sea. In general it might also be added here that in traditional Chinese art there are many images of lakes and streams but very few connected to the ocean. In addition, the tradition that says Liezi himself was from the kingdom of 鄭 Zheng, centered on the area around what is today 鄭州 Zhengzhou in landlocked Henan province, makes one wonder whether "海 hai" here referred actually to the ocean, whether it was to a large inland body of water, or whether that really matters. The 1722 and 1802 version both begin with glissandi in harmonics but some later versions do not. Some, such as 1670, seem simply to drop the opening harmonics; others, such as 1677, seem to have a rather different non-harmonic opening. This needs further study.